Since he gave permission to post it up, I have to share my experience with most customer service that I have encountered here in the past 14 years. I have lived in USA, Malaysia, Germany, Russia, Egypt, Yemen, UK and have travelled to all European countries, Australia, Hong Kong, Taipei and India and have never had this kind of treatment by any store. I ended up following his advice and buying everything from China for the same price as that silicone hose, which is the same everywhere. Still trying to find people who are serious and professional and won't rip me off because I'm a foreigner. Since he is unprofessional and is projecting, he will probably answer back. That will be posted later. If this offends anybody, admin can kick me off and delete my account. I'm not so into the Miata, because I'm more of a mid engine guy. This car was my second choice and I was stuck with it and it has caused me nothing but issues. His profile, the typical balkan alpha male wannabe. Last edited by yeopazman on 23.04.17. 21:04, edited 1 time in total. 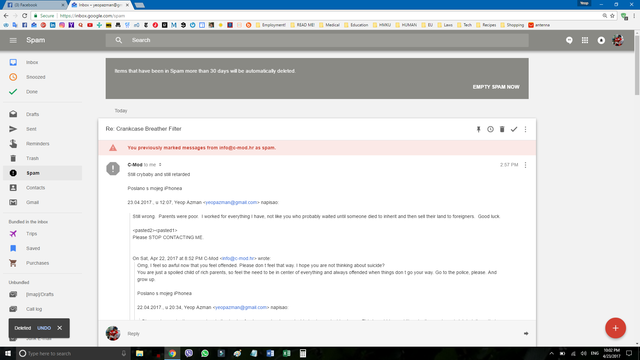 Can't read his response, img is kinda blurry. Still wrong. Parents were poor. I worked for everything I have, not like you who probably waited until someone died to inherit and then sell their land to foreigners. Good luck. Omg, I feel so awful now that you feel offended. Please don t feel that way. I hope you are not thinking about suicide? You are just a spoiled child of rich parents, so feel the need to be in center of everything and always offended when things don t go your way. Go to the police, please. And grow up. Dunno what to say really. I've stopped arguing with people over the internet somewhere in '96. If you think that your rights as a costumer have been violated there are couple of things you can do. Chamber of commerce, http://www.potrosac.hr/, http://potrosac.mingo.hr/hr/potrosac/cl ... p?id=12489, etc. Now depending on how much you spent with cmod and how crappy of a product/service you received will determine the result of "investigations" by those bodies.